Can say quintessence of Cambodian cuisine is the cuisine Amok. Amok bring dishes full of flavor, ingredients very own “the land of temples”. Pure sweetness comes from sugar Thot, greasy aroma of coconut water, smelled Prahok mingles with the aroma of banana leaves gently. All are characterized Khmer captivated anyone when tasted. No exaggeration to say that amok is the soul of Cambodian cuisine, because anything can evoke the cuisine of Cambodia, which is amok. Amok dishes traditional Cambodian Amok to mention the chicken and steamed fish Amok. Save Amok Chicken is made from raw materials is meat and chicken breast, coconut milk and Khuong (spices especially only in Cambodia), and some spices such as left-Wish, turmeric, galangal, onions, lemongrass, … Chicken after being clean for at marinated with Jiang, rice, coconut milk and some vegetables shrinkage creates dishes with rich taste, but no less tasty exotic. When taste Amok Chicken, visitors will feel the chicken toned mix with the sweet aroma of coconut, tourists will not worry dish will greasy because the vegetables nearly neutralized, put food on the easy to eat , eat and will remember forever, and the time is addictive. This dish is often very soft so called soup Cambodians. Amok chicken soup bowl that is not used in place of coconut, which gives the feeling cherish eating, enjoy the taste. Amok steamed fish dishes are quite picky over food chicken Amok. A dish to look after the processing is simple, but to create it, it requires a multitude of processes and types of materials together. Ingredients to create dishes include Fillet snakehead or Catfish, Khuong, coconut milk, duck eggs, jaggery, Prahok and intestine or sweet leaf cluster. Cambodians with esoteric formulas prepared a mixture of Khuong, coconut milk, sugar and eggs to bring to cook until it reaches the consistency of emulsion. Then the fish is cut into pieces and then be sprinkled to taste bloody water mixture prepared with leaf cluster intestine, forest lemons, lemongrass, galangal, lemon zest, garlic, shallots and chilli. These materials are blended together to create a new experience and exciting for this dish. Fillet wrapped when it was spicy wrap in banana leaves and steamed cooked. When ripe, the taste of banana leaves radiating outward stimulate diners want to quickly find out what is inside. Remove the banana leaves off, try a small piece visitors will immediately fascinated by the blend by spicy chili flavor make sweet meat, the fat in coconut milk and a little flavor of Prahok. On the afternoon of the rainy season in Cambodia, there is nothing more amazing when tasted with a little wine Amok Thot Cambodian specialties. Indeed, “the land of the temple tower” very suitable for housewives cuisine experience exciting and picky here. Cambodian Cuisine not too fussy, colorful cuisine neighbors but in return, the dishes are featuring Khmer originality, taste harmony which especially makes people enjoy if once tasted try not to forget. Amok dish is so. If you have the opportunity to tour Cambodia, travelers do not forget to enjoy rustic dishes are light! Kingdom of Cambodia between Thailand and Vietnam and Laos border, the north and the neighbors. Such a continuous layout, without being noticed, but for many countries, more and more attracted many tourists to visit each year. This is why? 1. Good. You have many ways to go to Kampuchea in Vietnam, including air and road. If you go to Kampuchea road in Hu Zhiming, is saved and the most fun. You just spent six hours in the car to many customers in Kampuchea, Sihanouk, Siem Reap phnompenh, the price is only 4 million 100 thousand of the votes. If you take a plane, a total of the formalities time the aircraft from the airport to the Siem Reap Johor is two hours the average price is jestar, 20 thousand tickets, vietjetair and vietnamairlines open. 2. Historical sites and local culture unique. Angkor Wat is located in Kampuchea can not be ignored. This is a historical relic of the Khmer empire from ninth Century to fifteenth Century to the surrounding jungle temple Angkor Wat has a very unique architectural culture and ancient Khmer conform to no conventional pattern. If your legs don’t come here, you can see the sunset of the experience of the temple of Angkor Wat. You can rent a bike or riding a Tuktuk price of about 3 million / day to. 3. There are a lot of travel let you choose in the capital of phnompenh, you can own to the neighboring city. The rugged road difficult to walk, but the price is very cheap. In addition, you will experience a fun way to see scenery. If you want to go to Hu Zhiming, you only spent six hours in the car, close to the vitality of the city. There are many bus routes, there are a lot of interesting destinations, let you stop and find a whole day. 4. Delicious food. Kampuchea’s cuisine street, diverse and fascinating. Anyone to love Kampuchea dishes and fried noodles fried rice in the country. In addition, you can also experience the local dishes to eat like a hamster, snakes and spiders, crickets roast. 5. The people are friendly people of Kampuchea are very friendly and open to foreign tourists. They are always enthusiastic to chat with the client, ready to laugh with your photo, if you want to. 6. Do not need a visa. Kampuchea is one of the 44 in Vietnam may not need to travel visa formalities. This mechanism helps you to come to this country, more convenient. 7. There are many interesting experiences with local people. 75% Kampuchea or agricultural culture and the beautiful scenery of Kampuchea is still a primitive agriculture, conform to no conventional pattern. They arrived here, you will experience that in the open space and the water of the river, the vast paddy fields. 9. Your beautiful beach. If you are looking for a place to go on vacation, a quiet beach, instead of the original facilities are big and crowded, you should choose to Kampuchea. From the capital phnompenh, you can go to the white horse, boat to the island of the rabbit. This island is only a few tents and electric lighting 4 hours / day, if you want to go to a bigger place to Sihanouk, or to take a speedboat to the island of vegetables koh. This island is very quiet, and the white sand and blue water. Here, you will feel completely relaxed, like you in the real paradise. 10. Cheap travel expenses. If you are considering where to travel, just very cheap, you should choose to Kampuchea. You don’t need a cost saving, but also can travel abroad. As temperatures in Phnom Penh reach the mid-30s C (90s F), ice machine driver Khiev Panha laces up a pair of figure skates and takes to the ice. Watched by a small crowd of Cambodians huddled around the sides of their country’s only ice rink, Panha skates confidently until he attempts a spin, stumbles and falls. At first glance, the 23-year-old’s skating abilities may seem less important than his handling of an ice rink resurfacing machine. But Panha is not only charged with maintaining the ice. He’s also a member of Cambodia’s six-person national figure skating team, and became one of the first Cambodians to represent their country in a winter discipline when he competed at the Southeast Asia Games in Kuala Lumpur August. It’s little wonder Panha is still finding his feet: it’s been less than three years since he took up figure skating, a sport that is notoriously difficult for adults to master. Most professionals, according to Cambodia head coach, former British international Clair Ben Zina, are generally acquainted with skating by their sixth birthday. “They learned as adults, which is unheard of in figure skating,” says Ben Zina of the team. Cambodia, which suffered greatly under the Khmer Rouge in the 1970s and during a subsequent civil war that ended in 1998, only got its first ice rink in 2013. Few Cambodians have even heard of the sport, and the national team wasn’t set up until 2015. Yet Panha and teammate Sen Bunthoeurn, who went to Kuala Lumpur for the competition, have made impressive progress in the few short years since they discovered ice skating. Unlike Panha, who fell into the sport, 27-year-old Bunthoeurn is a figure skating devotee. He talked his way into becoming an ice skating coach in May 2013, despite having no experience. Impressed with his gumption, management gave him 15 days to teach himself how to ice skate. He now trains at least four hours a day, five days a week, in addition to coaching groups of school-age students in the evenings. Much of his free time is spent on strength training and other workouts. In between sessions, he whips out his smartphone to watch videos of his figure skating heroes on YouTube. Just qualifying for an international competition was a big achievement for the pair, both of who come from rural areas where their parents work as rice farmers. It’s also a milestone for the country: not only does Cambodia have no snow or ice, its sole tiny ice rink is situated above three floors of food courts and clothing boutiques at Phnom Penh’s Aeon Mall. This year’s Southeast Asia Games was the first time figure skating was included in the line-up, and countries such as Malaysia and the Philippines already have much greater depth in the sport than Cambodia. That fact was reflected in the results: Buntheourn placed 8th and Panha 9th, in a field of nine competitors. Yet for Ben Zina, who moved to Phnom Penh in March, it marks the beginning of her ambitious efforts to get Cambodian ice skaters Olympic-ready. The coach has a 10-year plan that would see Cambodian speed skaters compete in Beijing in 2022 and figure skaters take to the Olympic ice in 2026. “The talent that I’m seeing at a young level is just as good as in any other country. Now it’s about me sticking around long enough to really develop and nurture that talent,” she says. Ben Zina sees Panha and Buntheourn as the seeds of a long-term strategy to take Cambodia to the Winter Olympics, which would almost certainly require the construction of a bigger ice rink. “They are the role models in the rink at the moment and they are hopefully going to be the coaches that assist me in the future,” she says. For the pair, their hopes lie in inspiring a new generation of Cambodian skaters to believe they, too, can achieve their dreams – no matter how wild those dreams may seem. Confused tourists found themselves being turned away by police officers this weekend from the old main gate of the spectacular temple of Angkor Wat. This view of the 12th Century stone ruins, one of the most popular destinations in Asia, had been commandeered as a backdrop to an impromptu ceremony, ordered by the man who has run the country for more than three decades. Prime Minister Hun Sen described the event as a prayer for peace and unity. And when Hun Sen orders something, it gets done in style. Thousands of orange-robed monks trooped in for the two-day event, along with schoolchildren, boy scouts and crowds of local people, dressed in white, as instructed. They were overseen by unsmiling security guards, who kept them well away from the prime minister’s party. Hun Sen’s security detail are notoriously protective; when trying to film his arrival, you can end up with a few bruises from them pummelling your back. A gilded shrine was erected next to the great moat of Angkor Wat vacation packages, decorated with five-tiered umbrellas, a Buddhist symbol of celestial status. Huge rolls of red carpet were unfurled across the dusty road. Neatly wrapped parcels were laid on gold dishes before which the monks would chant their blessings, with printed cards stating they were offerings from the prime minister. Government ministers, and some of Hun Sen’s business partners, the so-called “oknhas” or cronies, formed a reception line for him. Hun Sen came on both days of the event, arriving without warning, with his wife, Bun Rany. He walked slowly, apparently in some discomfort, greeting just a few of the guests, and had to be helped to sit down in front of the monks, where he leaned awkwardly against a cushion. He appeared weary, and older than his 65 years. But he sat through two prayer sessions, a traditional dance performance and carried out two candle-lighting rituals with his wife. Whatever ailments he has, it mattered enough to Hun Sen to see this ceremony through to the end. The ordinary people who attended were told simply that the event was to bless their country. As devout Buddhists, they seemed happy just to be part of such an opulent display of piety. But the timing was surely significant, following the most dramatic political developments for 20 years. In June, the main opposition party, the Cambodian National Rescue Party (CNRP), performed well at the important local commune elections, despite threats, intimidation and a near monopoly of media coverage by the government Cambodian People’s Party (CPP). The CNRP did equally well in the last general election in 2013, claiming that it was denied victory only by widespread cheating. It looked set to mount the most serious challenge to Hun Sen’s hold on power since he became prime minister in 1985. The government’s response was to shut down unsympathetic media, arrest the CNRP leader Kem Sokha on a bizarre charge of conspiracy in a US-backed plot to overthrow Hun Sen, and then, last month, to dissolve his party. Most of its leading politicians had already fled the country, including Deputy President Mu Sochua. Cambodia is now a de facto one-party state, heading for an election judged by the US and the European Union as illegitimate. The post-Cold War project, of rebuilding a country on democratic principles in which the UN and its members invested many billions of dollars, lies in ruins. In the US and the EU, there is talk of sanctions – something the CNRP is encouraging, however much they may harm ordinary Cambodians – as necessary pain for a better future. Hun Sen is a poorly educated man from a provincial Cambodian town, who lost an eye fighting for the Khmer Rouge in the 1970s, then defected to Vietnam, which invaded in 1979, overthrowing the fanatical regime headed by Pol Pot. He was appointed foreign minister at just 26 years old, and impressed his Soviet and Vietnamese patrons with his quick intelligence. He has proven himself to be skilled at outmanoeuvring his opponents with a mix of inducement, intimidation, and occasional thuggish violence. With his country heavily dependent on foreign aid just to run the government, he has allowed relative freedom to the media, political parties and civil society, while never allowing these to threaten his power. So why has he taken this drastic step now? China is now Cambodia’s largest aid donor, and has refused to criticise attacks on Hun Sen’s opponents. Western aid is relatively less important now, especially as the economy has grown quickly, offering substantial sources of income to Hun Sen and his cronies. Six years ago, the prime minister ostentatiously declared his official income to the public, of a little over $1,000 a month. In fact he, his wife and six children are thought to have amassed wealth worth hundreds of millions of dollars. So suggestions that aid may be withdrawn in response to the dissolution of the CNRP carry less weight. The EU and the US are, however, still the most important markets for Cambodian exports, in particular the textile and clothing industry, which has provided hundreds of jobs to poor Cambodians. If the EU were to withdraw the preferential trade access Cambodia gets as a least-developed nation, it would have a devastating impact on the national economy. But precisely because of that, the EU will be reluctant to take such a step, in a region where few countries uphold high democratic standards. Instead, it might use targeted sanctions, aimed at a few top officials, which might inconvenience their families, but would not threaten their money or status in Cambodia. The other reason Hun Sen has dispensed with the democratic facade he has been willing to live with all these years is the country’s changing demographics, and the arrival of social media. On a narrow peninsula between the Mekong and the Tonle Sap Rivers in Phnom Penh, workers are constructing a huge monument in stone, with carved friezes, rather like the great temples of Angkor, depicting Hun Sen’s achievements. It focuses on what he calls his “win-win” policy, by which he persuaded the Khmer Rouge to give up fighting in the 1990s, and end the long civil war. It is part of what appears to be a personality cult, with schools, hospitals, libraries and bridges named after the prime minister, who has added so many honorifics to his official title that few can remember how he should formally be addressed. Hun Sen sits on top of a network of patronage which has significant interests in almost every economic activity in the country. In theory, he should be untouchable. But most Cambodians were born after the war ended, and his “win-win” policy generally impresses only older people, who can remember the terrible years of conflict. Younger people are more aware of today’s endemic corruption, the massive disparity between rich and poor, and the injustice of practices like land grabs by well-connected businesses. It is those younger people in particular who backed the CNRP, despite its woolly policy platform and sometimes fractious leadership. They used social media to mobilise support for the opposition, bypassing the CPP’s near-monopoly of television and newspapers. Time is not on Hun Sen’s side. The cronies who fund his party, and who have benefitted greatly from proximity to him, may at some point decide that a change of boss is necessary. An aura of power still surrounds Hun Sen. If there is one axiom for observers of South East Asian politics, it is never to underestimate the Cambodian strongman. By staging his prayer ceremony at Angkor Wat, the national symbol that has been used in every flag since the country’s independence from France in 1953, he linked himself to the kings in Cambodia’s greatest historical era, while at the same time portraying himself as the top patron of Buddhism. Adept manipulation of such revered institutions can go a long way to sustaining legitimacy, in a country where harsh experience has instilled submission to authority in many people. But as other authoritarian leaders, like Suharto in Indonesia, or even the late King Sihanouk of Cambodia, have shown, when that legitimacy falters, it can crumble very quickly. In Cambodia tour package, a tour of Phnom Penh market is an experience you could not missed. Most markets have a wide selection ranging from fresh food to various clothes. Central Market – also referred to as Phsar Thmey, meaning ‘New Market’ – is one of the major landmarks in Phnom Penh. Designed by Desbois and erected in Art Deco style, Central Market was the largest of its kind in Asia when it was constructed in 1937 during the French colonial era. In an effort to preserve this unique architecture, Central Market underwent a renovation with funds from the French Developmental Agency before it was reopened to the public in 2011. Around the main buildings are stalls offering Krama (checked scarves), stationery, household items, cloth for sarongs, flowers and second hand clothes, usually from Europe and the US. On the eastern side of the building is the main entrance where you’ll come across shops that have items such as ornaments, T-shirts and souvenirs on sale. Likewise, head over to the market’s central area that holds numerous jewel stores, gold as well as silver jewelry collections. Further, the market has a slew of shops that especially deal in electronics, clothing and second-hand items at incredibly cheap prices. Above all, don’t forget to sample the distinctive food items available here. One of the specialty dishes is the creamy coconut pudding that is particularly great to relish during scorching afternoons. Russian market is located in the south part of Phnom Penh and is known to the locals as Phsar Toul Tom Poung. The reason why it is called Russian market is because it was a popular market among the Russian expats during the 1980s when most of the western expats in Phnom Penh were Russian. This market is popular to collectors of genuine antiques; also, for those looking for good reproductions. Filled with stalls selling sundry souvenir items (silk scarves and bags, woodcarvings, etc.) and clothing, Toul Tum Poung is a well-frequented market among tourists. The food area is very interesting to wander around, though be careful of the wet floor near the fresh food area as it can be slippery. Stop for lunch or a snack on the delicious local food offerings to recharge between your bargain hunts. The night market in Phnom Penh, located in front of the Phsar Chas (Old Market) near the riverside, is perpetually crowded with tourists in search of a good bargain. The market was originally aimed towards visitors and tourists but interestingly thought is that it is probably more popular among Cambodians than foreigners. At the moment, there are more than 150 stalls selling an array of items from clothing and ornaments to furniture and souvenirs. 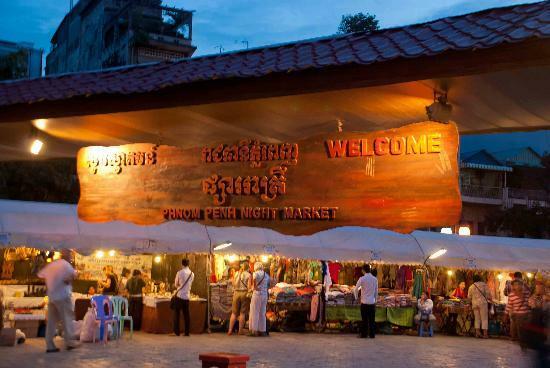 The entire setting of the Phnom Penh night market night market is made from natural material, and there are occasionally music performances and entertainment acts. It has a wide selection of all the usual tourist items including handicrafts, silks, art, T-shirts, curios, knickknacks, and souvenirs. While it is an open market like a local market, it has a bit more of a relaxed and festive atmosphere than a typical local market. The night market is a different addition to Phnom Penh’s shopping scene. Old Market (Phsar Chas) is a centrally located, local market, behind Night Market just one block west of riverside in the south end of the Old French Quarter. 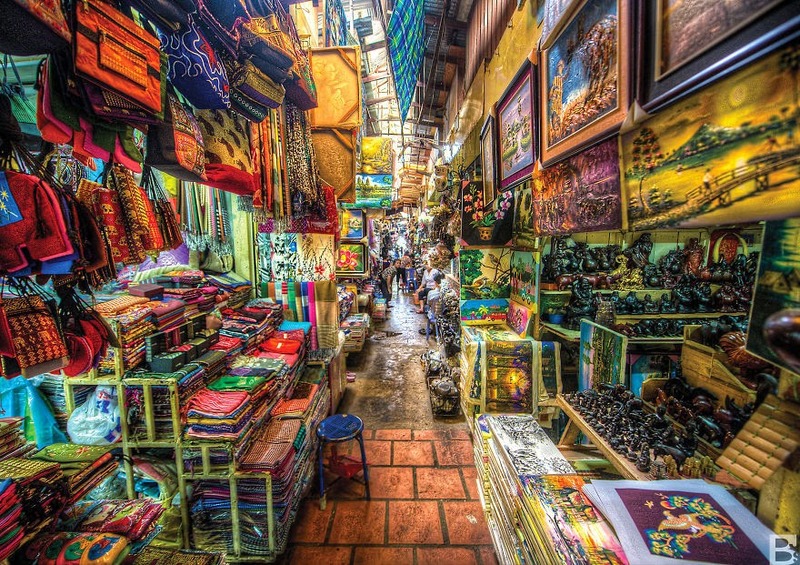 If you are looking for typical Cambodian souvenirs then you have come to the wrong place but if you want to get a glimpse of the local culture this is the market to go to. If you want to buy fresh fish and vegetable you should try to get there as early as possible before the best goods are sold out. Some of the stalls open already around 5am and at 6am you can expect all of them to be open. In addition, the market provides customers with a significant number of raw materials used for cooking food. Besides departments for food, the Old market has the stores selling products of old clothes and motorbikes. Many kinds of old clothes with affordable prices draw the attention of quite a few visitors including foreign tourists. Motorcycles are also displayed to customers with a variety of types of models. Due to this diversity of commodities, the Old market becomes more and more busy and crowded. Olympic market is one of the best places in town to find nice fabrics, most of the fabrics are end-of-roll textiles from the local garment industry. The market is additionally well-known for clothing fashion and accessories such as belts, glasses, wallets and shoes. Besides clothes, there are also numerous shops offering jewelry in the first floor. The second floor is specially for ladies with evening dresses worn in Cambodia on a festive occasions. The last floor located restaurants which offer a lot of special and tasty Cambodia dish with affordable price. Cambodia travel destination is not only holiday getaway with its historical sites and natural attractions, but also popular the local exotic food “fried tarantula”. Tarantulas first started meeting with woks in large numbers during the tragically widespread food shortages of the brutal 1975-1979 Khmer Rouge regime. After the Khmer Rouge were ousted, Cambodians realized that their crafty survival skills had rewarded them with a tasty new chapter of gastronomy. Most people suffered from hunger so they would just eat anything that they would find edible. The necessity resulted to a traditional exotic dish and aside from tarantulas, locals also eat scorpions, grasshoppers and silkworms. Nowadays, the A-ping has become a popular snack that both signify the history and culture of Cambodia. There are also other interesting superstitious beliefs about this dish because the locals say that eating one would make you beautiful. Women around the area believe that the snacks have cosmetic properties and can enhance your natural beauty. If you eat the legs first, you can get long and lustrous hair too. The Cambodians also believe that the tarantulas have medicinal properties. They are very useful for soothing back aches and treating breathing problems found in children. They are considered to be more effective when served with rice wine. Fried spider is a popular and favorite dish is Cambodia. They are a specialty snack that also attract the tourist population here. They are also bred in special holes in the villages of north Skuon. According to experts, the eating habit of fried spiders may have started due to desperation when there was shortage in food supply. The spiders used for the snacks belong to the species called tarantula and are known as ‘a-ping.’ They are the size of a human palm. The cost of the snack was about 300 riel ($0.08) in 2002. According to a travel book, the spiders are known as Haplopelma albostriatum, also called the zebra tarantula. The species is also known as ‘edible spider’ for more than hundreds of years. While you can find a vendor or two hawking trays of a-ping in Kampong Thom and Phnom Penh alike, the town of Skuon—75 kilometers north of Phnom Penh—is the epicenter of a-ping cuisine, and close to the spiders’ underground burrows where they are harvested. In nearby forests, children and adults set about tarantula hunting, searching for the small holes in the ground that are home to the spiders. They spend a few minutes poking a stick down the hole and making chirping sounds to bring them out of hiding. As soon as a spider shows its face, it is caught bare-handed. Cambodia travel destination is always attractive to many backpackers keen on discovering the local history. Here’s a detailed packing list for you in Cambodia. Making a trip to Cambodia by packing smart and bringing only what you need. You don’t want to over-pack or be weighed down by unnecessary luggage and items. If you’re headed to Cambodia during monsoon season, then a light rain jacket is a must. While they tend to only last for an hour, the heavy spells of rain and deafening claps of thunder will have you soaked within seconds otherwise. Before travelling to Cambodia you’d do well to take out an insurance policy to cover against theft, loss of personal items and documentation, illness and injury. However, before you pay for a new policy, it’s worth checking whether you are already covered: some all-risks home insurance policies may cover your possessions when overseas, and many private medical schemes include cover when abroad – check that they cover Cambodia. Students will often find that their student health coverage extends during the vacations and for one term beyond the date of last enrolment. Cambodia is a loud country, from the construction that rings heavy around Phnom Penh to the constant chattering on the phone during bus trips. If you plan on using the country’s network of buses, then, unless you want to spend hours listening to blasting karaoke songs or foreign films, drowning out the sound with your own music is a must. It’s well worth bringing a universal charger or adaptor because, depending on where you stay, the plug sockets will differ. And if you don’t want your laptop to fry or your phone to overheat, it’s well worth investing in a charger that comes complete with surge protection, too. Power cuts, especially during hot season, still plague parts of Cambodia, especially more rural areas, so it bodes well if you plan on exploring to take a mini torch with you. City centres are also often poorly lit, so you may want to put your torch in your bag during an evening out. Apart from being hot, Cambodia’s climate is often humid, so make sure you pack breathable clothes that can cope well with heavy sweating. Light, loose and cool clothing is essential. Because Cambodia is extremely warm and if you are visiting sites like Angkor Wat you will be doing lots of walking in the hot sun. It also bodes well to remember that Cambodia is a Buddhist country and when visiting temples, religious structures or palaces, shoulders and knees must be covered. Lightweight long skirts and light-colored, loose and long-sleeved blouses are good. There are mosquitos at night in some places. If you are enjoying sundowners sitting outside on a verandah or heading into the jungle and similar, it is good to have this portable mosquito repeller. Make sure you’ve liberally applied repellent before you go out, or covered up completely as mozzies love the dusk. It’s really worth paying attention to this as living with itchy mozzie bites can be miserable – prevention is most definitely better than cure. It can protect up to a 15-foot surrounding area. It’s good to have first aid with you while you travel. You will feel safe and when it comes to having an emergency need, you got it in your luggage. Travel first aid is a small, well designed with plasters, disinfectant, etc means you can quickly treat cuts and scratches and stop them getting infected. If you’re in the provinces then health care can be less than desirable, so make sure you bring a well-stocked travel first aid kit. Essentials include plasters, pain-killers, antibiotic cream, gauzes and bandages, and any prescription medicine. The ‘bum gun’ shower spray is the traditional way to get clean after using the toilet, although many establishments do provide toilet paper. However, if you’re heading out of town or getting the bus to somewhere more remote, don’t forget to take toilet roll, tissues or wet wipes with you – chances are there won’t be any in the bathroom. Cambodia is hot. The Cambodia sun is brutal, especially after 10am in the morning. Wear a hat and cover up when possible. Apply first thing in the morning and first thing in the afternoon. It’s good to protect your skin while you visit the Angkor Wat temple or lay down on the beach at Sihanoukville. The merciless sun beats down relentlessly in Cambodia, making sunscreen an absolute suitcase essential. A minimum of SPF50 is recommended, and for those sun gods and goddesses out there, yes, you will still tan. If you want to escape from the crowds in some Cambodia attractions, maybe Mondulkiri is the best alternative choice. Here, you have a chance to climb gradually through some of Cambodia’s most beautiful countryside, watch high waterfalls, river gorges, pristine jungle, pretty fruit and vegetable orchards, and immerse yourself in the fresh atmosphere. Mondulkiri is an eastern province of Cambodia. This hilly province is relatively undeveloped and low populated province in the whole country. Sen Monorom, the capital of Mondulkiri, is the perfect off-the-beaten-track destination. Due to lying at an altitude of nearly 800m, Sen Monorom is possible to get a pleasant break from the intense heat noticed on the lower plains. Mondulkiri province has a climate like the other areas in the country. There are two main seasons: dry season and rainy season. The weather throughout the dry season is in the region of 23 to 29°C with plenty of sunshine. In the summer the temperature can increase slightly, and range from 27 to 31°C. However, in general, Mondulkiri’s average temperature throughout the year is definitely lower than in other areas of Cambodia. The best time to visit Mondulkiri is in the dry season when the climate is dry and dusty but still pleasant enough to experience the local area. Bou Sra Waterfall is the largest, highest and most stunning in Cambodia. This waterfall is relatively easy to travel to by road, bus or car. The journey gives a perfect opportunity to admire the beautiful local scenery that consists of the ethnic Phnong villages, paper plantations, rubber plantations, coffee farms and rice fields. The Bou Sra waterfall is split over three levels with the top level having the fast flowing water. The second level is the favoured destination for the tourists that wish to bath and relax in the cool waters and natural surroundings. Also on this level, there are plenty of locals with stands set up to sell a variety of Phnong products such as agricultural products (honey, potatoes, beans and bananas) as well as scarves and clothes. The third level is out of bounds to travelers because it is very dangerous. A visit to Pahlung Village in the northern part of Sen Monorom is a popular destination within a one-hour drive of the provincial capital. It is the diverse regional culture and the scenic rustic setting. This helps to attract the attention of the tourists. This village is great for experiencing an elephant trekking trip. Pahlung Village is rich in scenic spots as well as the local houses and huts that are wonderfully designed. The surrounding forest area has many kinds of fauna and flora. You can take a half or full day tour in the surrounding area. For those travelers planning to stay the full day, there is the possibility of camping overnight in the village. The Chrey Thom Waterfall is easily found in the Sen Monorum district. During the dry season, the waterfall has 15m height and 2m diameter. While in the rainy season, this can be changed to 11m height and 8m diameter. Unlike the Boo Sra waterfall which becomes inaccessible in the wet season, Chrey Thom Waterfall can be accessible all-year-round. Here, tourists have a chance to see the plantation of Sro Lou around the waterfall. Especially, there is the huge brandy tree of Chrey which is standing there for quite a long time.